US small business optimism was virtually unchanged in March. Despite the stock market having recovered from its end-of-year rough patch and the government shutdown now firmly in the rearview mirror, the index remains noticeably below the current cycle’s high reached in August. The lack of a rebound suggests that small businesses are feeling the economy’s recent slowdown. Small businesses’ expectations for sales have come down since the fourth quarter, and fewer respondents indicate now is a good time to expand. Hiring plans have come down, although difficulty finding workers in such a tight labor market may on its own be reducing expansion plans. The availability of quality labor remains the most frequently cited problem among small businesses. Even as hiring plans have been pared back, a record share of firms reported having at least one job that is hard to fill. Total job openings continue to outnumber unemployed workers, but the vacancy rate fell to a one-year low in February. Job openings can bounce around from month to month and are subject to big revisions, so the 538K drop in openings in February does not unequivocally signal a collapse in demand for workers. It does, however, offer another sign that the labor market may be nearing an inflection point, as temporary hiring has also slowed and consumers’ views of the labor market have deteriorated slightly. Jobless claims have been better in recent weeks, with initial filings falling to a 50-year. The late timing of Easter this year may be flattering the recent figures, but the multi-decade low suggests at least that the slowdown in hiring is likely to be only modest. The consumer price index rose 0.4% in March, its largest gain in more than a year. Higher prices at the gas pump were partly to blame, but consumers also saw their grocery bills increase. Consumer price inflation is rising again on a year-ago basis and contributing to slower growth in real wages. A soft gain in March core inflation pushed core CPI down to 2.0% year-on-year. Prices for core goods are falling again, although the 0.2% drop in March looks to have been depressed by a BLS new data collection procedure. Services inflation continues to hold up better. Shelter costs rose strongly again in March, while services inflation ex-shelter remains within its recent band. US Treasury secretary Steven Mnuchin said this week that the United States and China have reached agreement on the enforcement mechanism of the trade agreement the two sides have been negotiating for months. Some details remain to be worked out, however, including the disposition of the existing tariffs regime. China would like tariffs ended immediately, but the US prefers to phase them out over time, so long as China remains in compliance with the agreement. Mnuchin offered no time table for a compressive deal but said he hoped it would be completed quickly. Minutes of the March meeting of the US Federal Reserve’s Federal Open Market Committee confirmed that a majority of officials expect that the evolution of, and risks to, the economic outlook will likely warrant leaving the target range for the federal funds rate unchanged for the remainder of the year. Participants found it noteworthy that inflation has not shown signs of firming in response to strong labor market conditions or short-term upward price pressure stemming from tariff increases. Most of the major US indexes recorded small gains for the week. The large-cap S&P 500 Index rose 0.5% and moved within roughly 1.1% of the all-time high it established in September 2018, while the narrowly focused Dow Jones Industrial Average recorded a slight loss. Trading volumes were especially muted throughout most of the week, with daily volumes hitting new year-to-date lows on Monday, Wednesday, and again on Thursday. Within the S&P 500 Index, financials outperformed, helped by a better-than-expected quarterly earnings report from banking giant JP Morgan on Friday. Communication services shares were also strong, boosted by a rise in Walt Disney shares after investors responded positively to the unveiling of the new Disney+ streaming service. Health care shares lagged, held down by drops in Anthem and UnitedHealth Group. Perhaps signaling increasing conviction in the strength of the economy, longer-term Treasury yields moved modestly higher for the week. New deals in the municipal bond market were well oversubscribed, with issuance headlined by California general obligation bonds and a large high yield deal for an oil refiner in Alabama. In terms of data release, on Thursday retail sales in March is due out. The weakness in recent months is expected to be temporary, as high consumer confidence, strong real wage growth and solid employment growth all speak in favour of solid private consumption growth. On Thursday, the preliminary Markit PMIs for April are due out, which will provide the first signal of how growth has performed at the beginning of Q2. With a 12 April deadline looming, the European Council granted the United Kingdom a second, longer, extension of Article 50. That extension means Britain now has until 31 October to advance through Parliament the agreement negotiated with the European Union to withdraw from it. While Prime Minister Theresa May is aiming to complete that process in coming weeks, there is a very real possibility that the UK will be required to hold European Parliamentary elections in late May. The prime minister has been engaged in talks with the opposition Labour Party on the potential for keeping the UK in a customs union with the EU, which would result in a softer form of Brexit than had been envisioned earlier in the process, but she faces internal opposition from members of her own Conservative Party on that front. A measure of British house prices improved for the first time since July but prices are still likely to fall in the coming months as Brexit weighs on the property market, according to a survey published on Thursday. The Royal Institution for Chartered Surveyors (RICS) said its monthly house price balance edged up to -24 in March from -27 in February, which was the lowest reading since May 2011. British shoppers cut back spending for the first time in almost a year last month, reflecting a mix of seasonal pressures and Brexit worries, according to the British Retail Consortium. 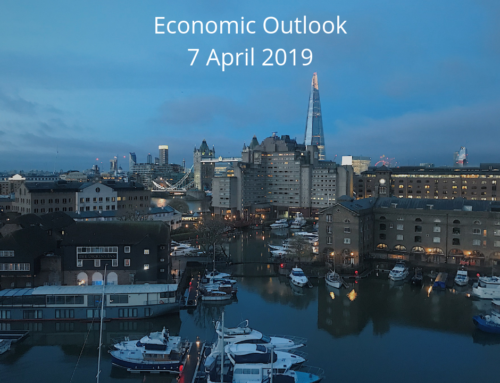 Consumer spending has until now been a relative bright spot for the British economy at a time when business investment has fallen due to uncertainty about when and how Britain will leave the European Union. There are no market movers in the UK this week. As highly expected. the policy meeting at the ECB was an “wait-and-see” meeting. Hence, the ECB kept all measures and forward guidance unchanged and did not make us wiser on the details of the TLTROIII-programme such as the pricing. Draghi said that the terms will be announced on one of the coming meetings (probably June or July), as the ECB want a thorough assessment of the effect on the bank transmission channel as well as further developments in the economy. Therefore, the terms of the programme is likely released at the June policy meeting together with the updated macro-economic projections. This time around, Draghi maintained a downbeat tone, as data has confirmed a slower growth momentum into 2019, and risks to the outlook remained tilted to the downside. On the other hand, he did mention that some factors dampening growth was fading. On inflation, he restated that underlying inflation is expected to increase over the medium term, but did see a decline in headline inflation over the coming months. But as expected, he did not see inflation expectations are de-anchoring. Furthermore, the ECB will also consider whether negative deposit rates needs mitigating for possible negative side effects, if any, on bank intermediation. But according to Draghi the ECB has so far not discussed pros and cons of mitigating tools. The STOXX Europe 600 Index lost ground during a week in which the European Union (EU) granted the UK a second Brexit extension and the European Central Bank (ECB) held its benchmark refinancing rate at zero. Italy’s stock market gained for the week even as Italy’s populist coalition government conceded that economic growth will be sharply lower in 2019 than previously forecast. The government approved an updated budget plan that forecasts growth will be 0.2% in 2019, which brings its estimates in line with the International Monetary Fund and the majority of private-sector economists. The ZEW print is out on Tuesday 16 April. There could be a small upside to the German expectations print based on the recent data points (from e.g. China) and an expectation for the current situation to stabilise around its current level. In contrast to the weak data points from manufacturing PMIs, the German Ifo showed its first rebound in March since August 2018. The Ifo is typically a more reliable leading indicator of GDP than the PMIs, and hence paints a more optimistic picture of the German economy. On Wednesday 17 April, the final March euro area inflation data will be released. The flash print disappointed with core inflation falling back to 0.8%. No revision is expected, but the final print will reveal how much of the slump in services prices was due to seasonal effects related to the timing of Easter, which is likely to reverse in April. Total bank lending in China rose a record 13.7% in the first quarter of 2019 as the government’s stimulus efforts begin to gain traction. Also welcome was a sharp rebound in export growth in March, though seasonal distortions caused by the Lunar New Year holiday continue to muddy the data. The general view is that the world’s second-largest economy is showing signs of stabilization after a sharp slowdown in 2018. Mainland Chinese stock markets fell for the week, as traders took a breather after four straight weeks of gains and waited for a US-China trade deal amid reports that both sides are closing in on a final agreement. For the week, both the Shanghai Composite Index and large-cap CSI 300 Index, considered China’s blue-chip benchmark, shed 1.8%. Though the latest week’s decline marked the Shanghai Composite’s worst week of 2019, Chinese stocks remain among the world’s best year-to-date performers, as investors have grown more confident that a trade deal is on the horizon and Beijing implemented a batch of easing measures to offset softer growth. So far this year, the Shanghai Composite is up 27.9%, and the CSI 300 has gained 32.5%, according to Reuters. The focus in China continues to be on trade talks with the US, which go on ‘around the clock’ according to US Treasury Secretary Stephen Mnuchin. The two sides keep making progress but it takes time to agree on all contents and wording in what is a 150-page document. A deal is expected to be reached within the next 4 to 6 weeks but the two sides have been clear that it is more important to take the time to reach a good deal than the exact timing of it. On the data front, GDP for Q1 will be released which is likely to show a further decline in growth to 6.3% year-on-year from 6.4% year-on-year in Q4 18. Industrial production, fixed asset investments and retail sales for March will also be published. The data for January and February was quite soft but early indicators for March have pointed to improvement. Sources: Wells Fargo, T. Rowe Price, Handelsbanken Capital Markets, Reuters, Danske Bank.